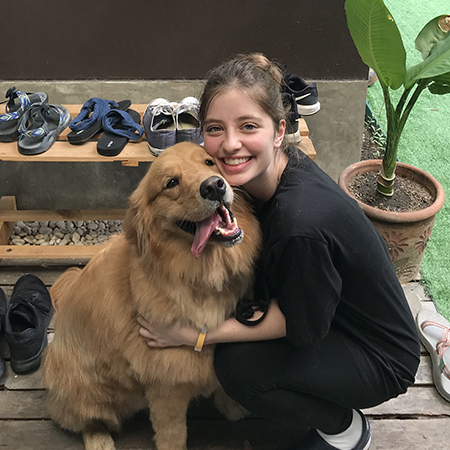 Daemen pre-vet students Lizzie Potalivo and Samantha Garcia spent two weeks in Thailand working with professional veterinarians. 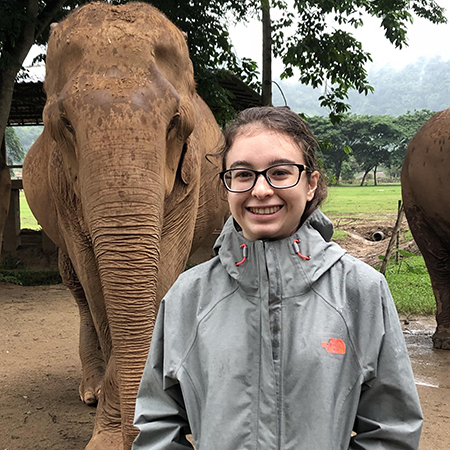 Traveling with study-abroad organization Loop Abroad, the students were selected as part of a team that worked with both rescued elephants and dogs in need of care. Potalivo and Garcia performed one week of service at the Elephant Nature Park in northern Thailand. The reserve is home to 60 elephants that have been rescued from trekking, logging, or forced breeding programs. The students fed and cared for the elephants — many of which suffer from chronic injuries or blindness from abuse. Lizzie Potalivo at the dog rescue clinic at Animal Rescue Kingdom in Thailand. The second week of the trip was spent in Chiang Mai at Loop Abroad’s dog rescue clinic at Animal Rescue Kingdom. Under the guidance of professional veterinarians, the students performed check-ups and cleanings, diagnosed and treated ear and eye issues, administered vaccines, treated wounds, and helped with sterilization surgeries. Potalivo noted that working in a shelter was eye-opening. Samantha Garcia at the Elephant Nature Park. For more information regarding study abroad and upcoming destinations, visit Daemen.edu/studyabroad.